Jannick Rolland knew that she wanted to work with technology when her mother, a fan of literature and the arts, took her to a play when she was 16. But instead of watching the actors, Rolland was transfixed by the lights and speakers above the stage. At that moment, she knew she wanted to work with technical design. Her calling isn’t theatre, though; it is optical engineering. Rolland, the Brian J. Thompson Professor of Optical Engineering, is a leading expert in the new field of freeform optics, which enables sensors, mobile displays, and a host of other devices that are not only smaller in size, lighter in weight, and less expensive—but also out-perform those containing traditional lenses and mirrors. She directs the Center for Freeform Optics (CeFO), a collaboration with University of North Carolina and several optical companies. In addition, she is one of the eight influential women pioneers in augmented and virtual reality listed by the organizers of the Augmented World Expo. Rolland is from France and completed her bachelor’s and master’s degrees there. She originally came to the United States as a visiting student at the University of Arizona, teaching and working on large telescope design. After a couple of years, she decided to stay and pursue a PhD with a focus in medical imaging to broaden her expertise on how to think of image quality assessment. Telescope design has remained a part of her research interests. She is currently working on optics for small satellites, such as CubeSats, as well as on augmented reality (AR) glasses. During post-doc years at the University of North Carolina, Chapel Hill, she designed AR headsets for medical imaging, which could be used to guide surgery. During that time, she led the Vision Research Group for four years and worked on studying perception in AR. From UNC, she moved to the University of Central Florida, where she spent thirteen years before coming to the University of Rochester in 2009. 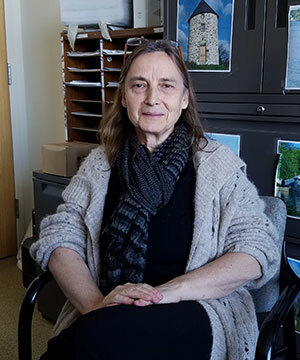 Overall, Rolland doesn’t feel she was ever treated differently working as a woman in academia, in the sense that she was not taken less seriously or judged for being a woman. However, she does contend that the work can be isolating sometimes, especially when the “old boy network” still hold sway in many places. But at Rochester, she is treated as an equal, and feels included and respected in the department. She also has multiple successful collaborations, one of them being her role with CeFO. In this capacity, she works with 16 faculty and 32 students across two universities, 30 percent of whom are underrepresented in STEM (science, technology, engineering, and mathematics) fields. Meanwhile, her company, LighTopTech, which she cofounded with a PhD student, is in the running for $1 million in investments from the accelerator Luminate.